Great stitching and beautiful rocks. I bet the kids really will love finding them. Oh, I love the rocks - they are so bright and colourful! You were certainly rockin it!! Love the paisley one! Yay! ORTs! Cute tiny stitches! Wow, those are really fun rocks! Sweet small stitching, how many are you going to stitch? Love the rocks, they're very colourful! Those rocks are so fun. I especially love the heart ones! These tinies have a lot of detail so it's no wonder that they take days to be stitched each. That's one reason why I love Donna Kooler's designs. Are you planning to stitch all 365 designs from the book?? Just wondering! 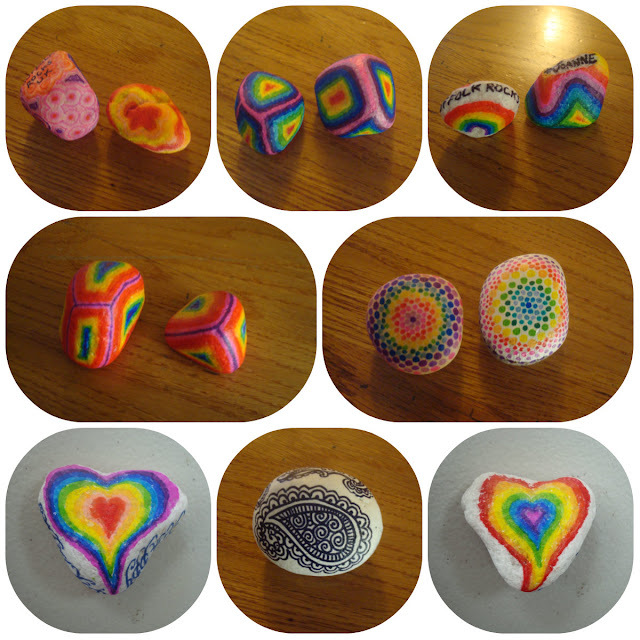 Great colourful and jazzy rocks, bet the kids loved them. It's amazing how those smaller patterns have so much detail in them, isn't it? Very deceptive!! I think I have the same book, I love Donna Kooler designs! You can tell from your ort jar that you have been busy!! Lovely stitching! Oooops, forgot to mention those lovely rocks, you really have a talent for painting! Those kids sure are lucky!! Nice TUSAL progress! I love your stones, especially the rainbow mandala ones on the right. Love the rocks Jo. You are so talented.